Search Analytics. The impression and average ranking data, by keyword and landing page, make this tool worth the hassle it sometimes takes to set up Search Console. This is the only place you can find (theoretically) reliable data on keyword performance for natural search. The numbers you see in this section will never exactly match the data in your web analytics. 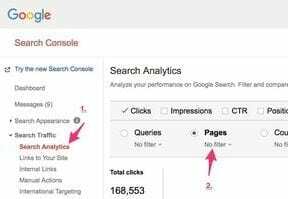 Google can only supply analytics data in Search Console based on its own performance, not from other search engines. And even then, the Google-referred data reported in Search Console won’t match the Google-referred data in analytics. But the trends should be the same. And don’t miss the new beta version of this tool, with access to 16 months of data! Links to Your Site and Internal Links. Similar to the analytics tool, these link tools help you understand which links are pointing to your site and the pages on your site that they link to. They’re invaluable when attempting to diagnose a link quality issue that may be algorithmically dampening your site’s performance in rankings. Manual Actions. If you’ve been banned for web spam, you’ll find out more about it here, as well as in the Messages section. International Targeting. Analyze the signals your site is sending Google about the languages and countries supported in HREFLANG (language) tags. You can also alert Google to the country your site is targeting. This is especially useful if you manage a site that doesn’t have a specific ccTLD such as .de or .kr. Mobile Usability. Since more than half of its searches are conducted on smartphones, Google has a soft spot for mobile usability. This report identifies issues that mobile searchers may experience. Your pages can’t rank in natural search or generate traffic without first being indexed. Google uses this section to communicate your site’s indexation status. Index Status. 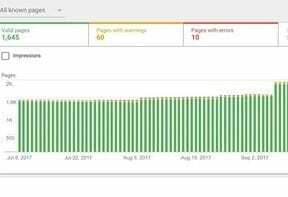 Think of this tool as showing the number of pages that are eligible to rank in Google. Remove URLs. Treat this tool with care because it will do just what it says: remove pages from the index. That’s beneficial when private or secure information has been published accidentally, or when a section of content adds no value to natural search. Unfortunately, it’s also easy to slip up and remove content that should be indexed. URL Inspection. The URL Inspection tool is new in the beta Search Console. It rolls up crawl and indexation information for one URL into individual pages. It all starts with the crawl. If Google has problems crawling your site, the pages that are not crawlable will have a very hard time ranking. Crawl Errors. Google also displays this information on the dashboard. You’ll find server header issues here, from 404 file-not-found to 500 server unavailable issues. When they spike, you likely have a larger crawl issue that can result in decreased rankings and performance. Crawl Stats. In the last 90 days, how much time did Google spend crawling your site? You’ll find the answer here. Spikes may indicate server issues or the launch of new content that requires crawling for the first time. Fetch as Google. The best way to see your content like Google does is to fetch the page and render it in this tool. You’ll see the way that Google interprets the page, as well as what the users see in their browsers. You’ll have the option to submit the page to Google’s index as well, which is a handy feature when you’re launching new content. txt Tester. The robots.txt file can restrict and allow crawl access to different areas of the site. Like the “Remove URLs” tool, changes to the robots.txt file should be managed carefully. Test all proposed changes in this tool to prevent costly accidents, such as preventing search engines from crawling your entire site. Sitemaps. Roll out the red carpet for Google by submitting your XML sitemaps for crawling. This tool allows you to submit the sitemaps. The tool then reports on how many of the URLs in the sitemaps are indexed. URL Parameters. If you have parameter-based URLs that you want Google to stay away from, submit those parameters in this tool. For example, search engines don’t need to crawl versions of pages sorted in different orders. If a parameter controls that sorting, submit it here to make Google’s crawl more efficient and increase crawl equity.